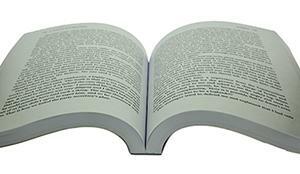 PUR binding is a type of adhesive binding used by print finishers and bookbinders in order to hold pages together. During the binding process a thin layer of adhesive is spread across the spine, with a paper cover folded over the top to create a finished product. Commonly used for binding books, magazines and brochures, PUR binding is an effective way of ensuring a strong, durable finish. At a glance it would be nigh on impossible to tell the difference between a perfect bind and a PUR bind. The binding process is essentially the same in both instances; it is the adhesives that differ. Perfect binding uses ethylene vinyl acetate (EVA) adhesives, as opposed to the polyurethane reactive (PUR) adhesives used in PUR binding. PUR adhesive offers greater adhesion than EVA, making PUR binding an ideal method for products that will be used repeatedly, such as catalogues and trade show brochures. Page pull tests have shown that PUR can offer up to 60% increase in strength over EVA, essential when a product is to be handled frequently. It can also provide a solution for difficult paper types that can cause problems during the binding process. As well as its strength and durability, PUR also offers superior flexibility. A far thinner layer of adhesive is administered during the binding process which means that books can be opened fully to a ‘lay-flat’ position, minimising the chances of the spine cracking and unwanted page loss. The other benefit of using less adhesive is that when binding thinner books (from 3mm upwards) it is still possible to maintain a square, rigid spine. If you are looking for a high quality binding method that will offer both durability and flexibility, PUR binding might just be the answer. If you’d like to discuss your binding requirements, please just give us a call on 0207 606 3361.